Copán Ruinas is one of the most visited places in Honduras. It is a calm and beatiful small town where you can enjoy ancient culture and sublime nature nestled in the foothills of western Honduras. For years, Copán has been renowned for its magnificent Maya Ruins, a designated World Heritage Site believed by archeologists to be the cultural center, the Paris, of the Maya world. Copan Ruinas is located 7 miles from the Guatemala border, so it is easy for people that visit Mayan Ruins in Guatemala to come to Copan. Copan was the governmental and ceremonial center of the Mayan civilization, known for its remarkable series of stelae, which are sculpted rocks, usually representing ancient rulers of Copan. The stelae are located in the central plaza, which is next to the acropolis ( a large complex of overlapping step-pyramids, plazas and palaces). Campo de pelota: a court where the Mayans played a ball game, with their elbows, head and knees. 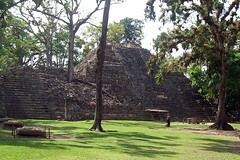 Escalinata de los jeroglificos: A huge stairway made of stone, that has the history of the Mayans sculpted in its steps. Templo de Rosalila: a temple constructed in 571 a.d. which was used for religious ceremonies and at present time it is located under one of the pyramids in Copan. Besides visiting the ruins, you can do a lot of activities. If you want to study spanish in a small town, Copan might be the right place for you, there are a lot of spanish schools in town. Also, you can go horsebackriding, birdwatching, go on Canopy Tours, Take a Hike to Rarely Seen Ruins and Hidden Waterfalls, Go Birdwatching, Soak in a Thermal Hot Springs, Explore Mysterious Caves, Camp in Remote National Parks, Go Kayaking or Tubing on the Copán River, Visit an Aquatic Park, Walk along the Scenic Copán River to the Ruins of Los Sapos, Go Mountain Biking, Visit Beautiful & Historic Colonial Towns in the Mountains, Tour a Coffee Farm, and Bring Home a Sample, and See Local Artisans Practice Their Craft. As you can see, you will never get bored in Copan. Just one final hint, one of the best restaurants to eat in Copan is Restaurante Carnitas N’ia Lola, where you can taste typical Honduran food. They are known for serving large portions of grilled and barbacued meat and vegetarian dishes at reasonable prices. Some of the recommended dishes are: Alambritos (Steak with melted cheese, bacon, onion, sweet pepper, with sides of salsa and pickled veggies) and the Plato Tipico (6 ounces of grilled steak, chicken or pork, sunny side up eggs, refried beans, cheese, rice and pickled veggies). Carnitas N’ia Lola is located 2 blocks south of the city museum. 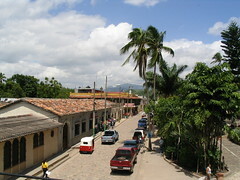 It is a really nice small and peacfull town in Honduras, don’t miss it.